This is actually a couple of weeks worth since I didn’t have time to keep up with this toward the end of the Women in SF&F event. These are all review copies. 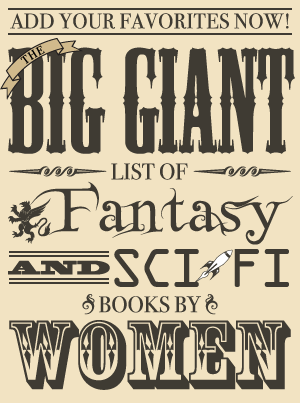 Usually, I’d be putting this up tomorrow, but I’m still working on my final Women in SF&F post. So I am going to put this up today, and I’m hoping that can go up tomorrow. Then I am hoping I can finally write my reviews of Range of Ghosts by Elizabeth Bear and Bitterblue by Kristin Cashore and finish The Killing Moon by N. K. Jemisin so I can review that as well. Sorry for the delay – between working full time and running last month’s event, I haven’t had time for reviewing (or even reading that much, which has mostly been limited to a little bit here and there before going to sleep). But after tomorrow’s post, I’m hoping to go back to a more regular reading/reviewing schedule! 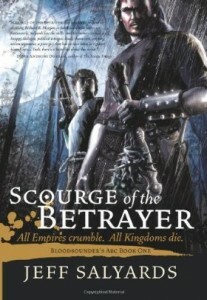 This debut novel was released earlier this month in both hardcover and ebook. There is an excerpt available on the author’s website. I’m really curious about this one, especially after reading Sarah’s review at Bookworm Blues. She’s normally skeptical about books supposed to be gritty fantasy like this one, but she liked this one quite a bit. 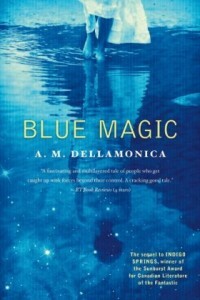 Blue Magic was released in trade paperback and ebook last month. It is the sequel to contemporary fantasy Indigo Springs, which won the Sunburst Award for Excellence in Canadian Literature of the Fantastic. There is an excerpt on Tor.com, as well as one from Indigo Springs if you haven’t read that one yet. First in a two-novel series, this ecofantasy delivers a powerful story of good intentions gone terribly wrong and introduces a promising new voice that brings a fresh vision to the genre. Recommended. “Good intentions gone terribly wrong” sounds intriguing! I’m also interested to read how A. M. Dellamonica handled women in the law like she discussed in her post for the Women in SF&F event last month. 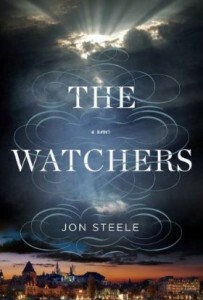 The Watchers, the first book in a new trilogy, will be on sale in the US in both hardcover and ebook formats on May 29th. (It is already out in the UK.) An excerpt can be read on the author’s website. This is Jon Steele’s first novel, although he has written a memoir about his experience as a news cameraman entitled War Junkie. Meet Marc Rochat, a man-child who has devoted his life to being the bell ringer at the Gothic Lausanne Cathedral, one of the greatest architectural structures in the world. Eerie things have been going on in and around his church, including tremblings in the underground crypt and a variety of gruesomely murdered bodies showing up in nearby streets. Across the square from the cathedral lives Katherine Taylor, a beautiful young American woman who is making phenomenal money as one of the highest-priced call girls in Switzerland; she’s a bit too introspective for her own good and, unfortunately, much too observant of her clients’ peccadilloes. Rochat’s and Taylor’s lives collide with Jay Harper, a British private eye who has been sent to investigate the killings and other strange doings; alas, he has no memory of who hired him or precisely why he was chosen for the job. And now all the clues are pointing skyward, where fallen angels are said to haunt Lausanne.